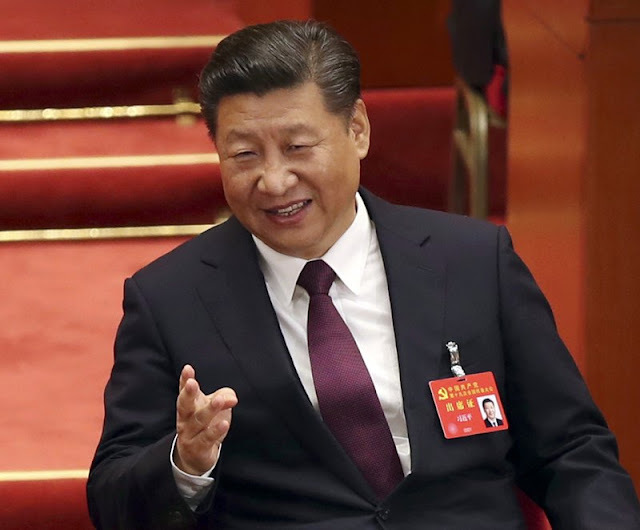 BEIJING (AP) — China’s economic growth stayed relatively stable in the latest quarter, buoyed by strength in retail spending and exports, giving the ruling Communist Party a boost as it prepares to appoint President Xi Jinping to a new term as leader. Growth edged down to a still-robust 6.8 percent compared with a year earlier in the three months ending in September, down marginally from the previous quarter’s 6.9 percent, government data showed Thursday. Growth has been unexpectedly strong this year, but forecasters expect activity to weaken as Beijing tightens controls on bank lending to cool a rise in debt cited by analysts as the biggest threat to China’s economic stability. Communist leaders are trying to steer China to slower, more sustainable growth based on consumer spending instead of exports and investment. Beijing has used repeated infusions of credit to prevent activity from slowing too abruptly, but that has pushed up debt and delayed the economic rebalancing. No major policy changes are expected at the meeting, but companies and investors are watching for signs of where the party will go on economic reform and how fast. In his speech Wednesday, Xi repeated promises to give market forces the “decisive role” in allocating resources but also affirmed the party’s intention to build up state industry. Reform advocates say that might waste money and drag on economic growth. Thursday’s data showed retail sales rose 10.3 percent in September over a year earlier, down slightly from the 10.4 percent rate of the first three quarters, according to the National Bureau of Statistics. That was helped by a 34.2 percent rise in e-commerce spending over a year earlier, an 8.1 percent improvement over the same period of 2016. The party’s decision to go ahead with announcing the data during its politically sensitive congress had prompted expectations they would be positive. Trade data reported earlier showed export growth accelerated in September to 8.1 percent from August’s 5.5 percent, at least temporarily averting concern about politically dangerous job losses in export industries that employ millions of workers. Investment in factories, office buildings and other fixed assets rose 7.5 percent in the first three quarters, down from the first half’s 8.6 percent rate. Factory output rose 6.7 percent in the first three quarters, up from 6 percent at the same time last year. The International Monetary Fund has forecast China’s full-year growth will hold steady at last year’s level of 6.7 percent. The IMF raised its outlook twice this year, citing strong government spending. Regulators have cited reducing risk in China’s financial system as a priority this year. Banks have been told to look closely at borrowers, especially those trying to make acquisitions abroad, to ensure they can manage their debts. The ruling party’s plans call for doubling incomes from 2010 levels and achieving a “relatively prosperous society” by 2020. In a report, UBS economists said that should require growth of just 6.3 percent for the rest of the decade. 0 Response to "China’s economic growth stays stable as ruling party meets"